Huw Belling (Sydney, 1986- ) is a composer and conductor, and the Principal Artistic Associate of Sydney Chamber Opera. He has read for a Doctor of Philosophy in composition at St. Catherine's College, Oxford with Robert Saxton, a Masters of Music at the Royal College of Music, London with William Mival, and completed a Bachelor of Music at the Conservatorium of Sydney. 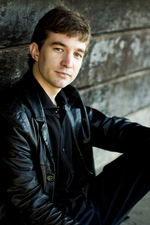 During his student years Huw won two national competitions in Australia resulting in premieres by Ensemble Offspring in Sydney and the Grainger Quartet at the Canberra International Music Festival. Huw's works are performed and toured in Australasia, Europe, the UK, and the Americas with vocal works in the repertoire at Westminster Abbey, and with Ensemble Plus Ultra. Huw has written extensively for both choir and voice, recent works including Inside Mr Enderby (2017) for the Manchester Collective, and Victory over the Sun (2016), a total reimagination of the lost work by Mikhail Matyushin, for the Biennale of Sydney. Among Huw's commissions are works for the Australian Piano Quartet, the Australian cellist Richard Narroway, and fellow composer and pianist Jack Symonds. Huw has conducted Australian premieres with Sydney Chamber Opera (Glass, Symonds, Bach) and continues to produce new and established works with that company. He is also the co-conductor of the Inner West Voices, and the conductor at St Stephen's Macquarie Street, Sydney.